Taipei, May 16 (CNA) President Ma Ying-jeou said Thursday that it would be easier for Taiwan to solve its territorial dispute with the Philippines if the two countries sign a fishery agreement first. 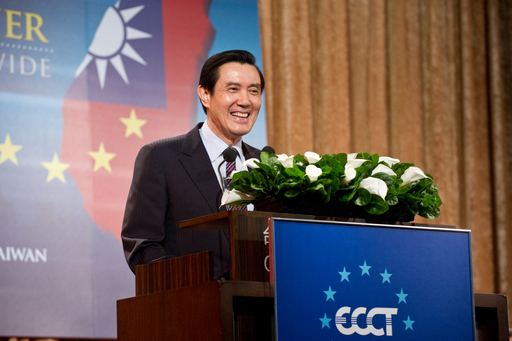 Speaking at the Europe Day Dinner party organized by the European Chamber of Commerce Taiwan (ECCT), Ma said that Taiwan and Japan concluded a fishery agreement last month as part of his proposed East China Sea Peace Initiative. Under the terms of the agreement, Ma said, Taiwanese and Japanese fishermen can operate boats freely in a wide sea area, while both sides will have a joint conservation and management zone. He said the negotiation of such a fishery agreement is similar to Europe's negotiation to solve the oil resources dispute in the North Sea in 1960s and 1970s. Under that negotiation, all concerned parties were able to negotiate with each other and eventually reached an agreement. Ma said he has learned from this "remarkable experience" because he believes that "national sovereignty is in-dividable, but resources can be shared." "By having a fishery agreement first, I'm sure that the prospect of solving the almost intractable territorial disputes may be a bit easier," the president said. "But in any case, I think this is probably the best way to approach international disputes, including the one we have with the Philippines," he noted. The East China Sea Peace Initiative was first proposed by Ma on Aug. 5, 2012. In it, he called on all concerned parties to settle the territorial dispute over the islands through peaceful means and to not fuel tensions. The president's remarks were made amid growing tensions between Taiwan and the Philippines following the fatal shooting of a Taiwanese fisherman by the Philippine Coast Guard on May 9. Taiwan on Wednesday imposed sanctions to express its dissatisfaction over Manila's response to Taiwan's demands for a formal apology, a promise to bring those responsible for the fisherman's death to justice, compensation for the victim's family and a commitment to fishery negotiations. The sanctions include a "red" travel alert urging Taiwanese people not to visit the Philippines, and the suspension of exchanges between high-level officials from the two countries. Taiwan also decided to remove the Philippines from its visa-waiver program and suspend economic exchanges, fishery cooperation, science and technology cooperation, and bilateral aviation negotiations. Taiwan had already taken other punitive measures against the Philippines, including suspending the hiring of Philippine workers, recalling its envoy to Manila and asking the Philippine envoy in Taiwan to return home to help handle the case. Separately, Ma said at the ECCT dinner party that Taiwan will continue to improve its economy and seek a free trade agreement (FTA) with Europe so as to promote trade and investment between the two sides. But Taiwan still needs to do more to further liberalize its trade and deregulate its economy in preparation for an FTA with Europe, he said. Frederic Laplanche, head of the European Economic and Trade Office (EETO), said at the party that the two sides "have more homework to do at this point." Europe and Taiwan have to continue to improve the bilateral environment for their business people in order to deliver the result of a win-win situation, Laplanche said.